I'm not a very competitive person - with other people that is. So now, I feel like I'm a parent talking to their child - except I'm the child. "You did your best. You are a winner for participating." And I think it is true! I have never entered an on-line scrapbook challenge where winners were selected based on their results. Previously I've only done the blog candy challenges with randomly selected winners. Those are fun, low pressure though I think we all still try to display something we are proud of. This time I really fussed over my layout and I'm pleased with it. It wasn't a winner but I had fun, got a great layout for my personal album, and got out of my comfort zone a little. My Mind's Eye recently had a challenge where layouts had to: 1) use a particular sketch 2) have the title "It's a ___ Thing and 3) use 80% MME product. I thought the last option made this a very doable product challenge since it is really hard for me to use only one company's product. In this case, I only had MME papers to start. I ordered the tinselly ribbon and glittery letters. Other than ink, the only other non MME items are some gold Stampin' Up! 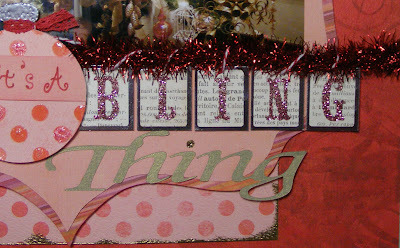 cardstock and Bazzill rhinestones. Now about the subject of this page. I'm not a flashy dresser. Talbots, Lands' End and LL Bean are my favorite sources of clothes. I like my jewelry discreet and traditional so I'm not someone drawn to sparkly things except.... 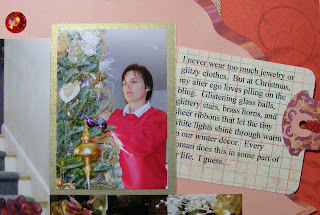 When it comes to my Christmas decorations, bring on the BLING! I love all the delicate, shiny, semi-opaque light catching, glittery, weirdly shaped, ribbon adorned baubles I can cram onto my tree and garlands. I make a few concessions to design but mostly I want them to be shiny, beautiful, and warm the house on cold, drab days. And we sure are having plenty of cold days to warm up this season! To meet My Mind's Eye's requirements to use 80% their product, I had to get inventive with pattern paper. 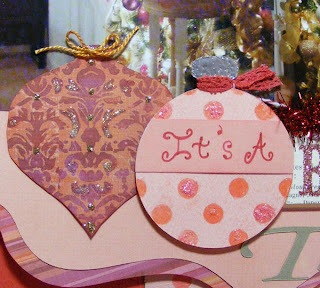 To get the design for the ornament on the left centered on the pattern paper, I cut a design out with the Cricut. Then I used the negative space as a template to mark the pattern paper and cut it by hand. Lots of Stickles gave it that Bling. I cut the round ornament on the Cricut. Stickles and Ranger's Glossy Accents glitzed up the polka dots. The top is embossed in American Crafts Zing silver embossing powder. To get the bottom layer of the shaped background to fit on my Cricut mat, I turned it about 30 degrees and got a really fun look with the stripe. The BLING letters are hole punched and strung to the tinsel with baker's twine. Click here to check out the other entries over at My Mind's Eye. There are some very inspiring layouts. The winner's design and workmanship are awesome! 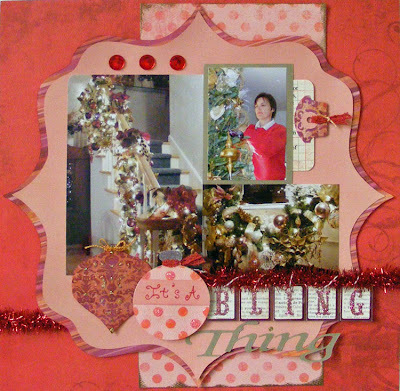 MME Blog Challenge 18 Winners There is a link there to the photo album where you can see all the entries at once. Entering a layout contest is definitely something I'll do again.